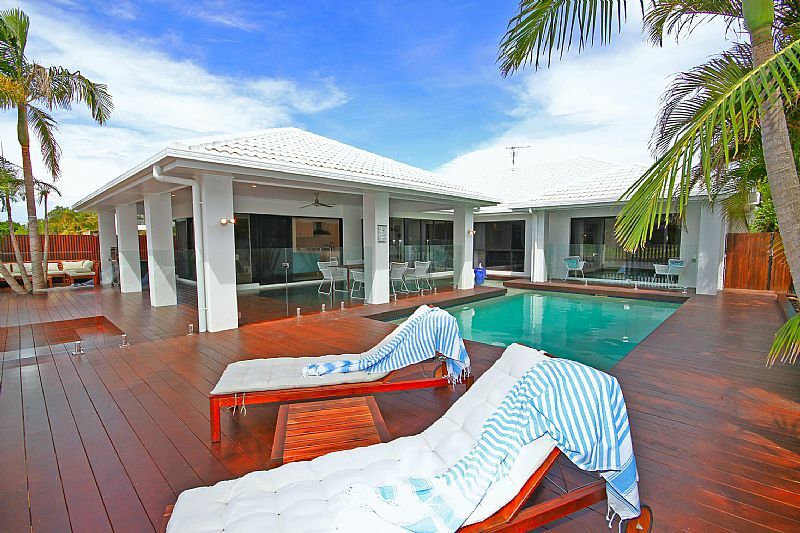 A stunning executive resort style waterfront home for you to experience a perfect relaxed getaway. 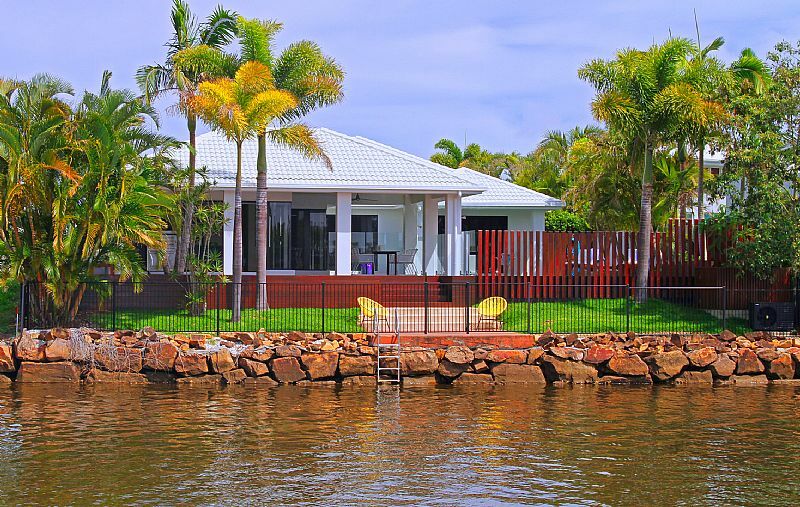 You will love all the alternate entertaining areas along with the resort style saltwater pool that also captures impressive north facing open water views across Twin Waters Lagoon & canal. Walk to Twin Water Golf club for 18 holes (or lunch!) or given the abundance of aquatic life, just throw the fishing rod off the front deck jetty and relax. 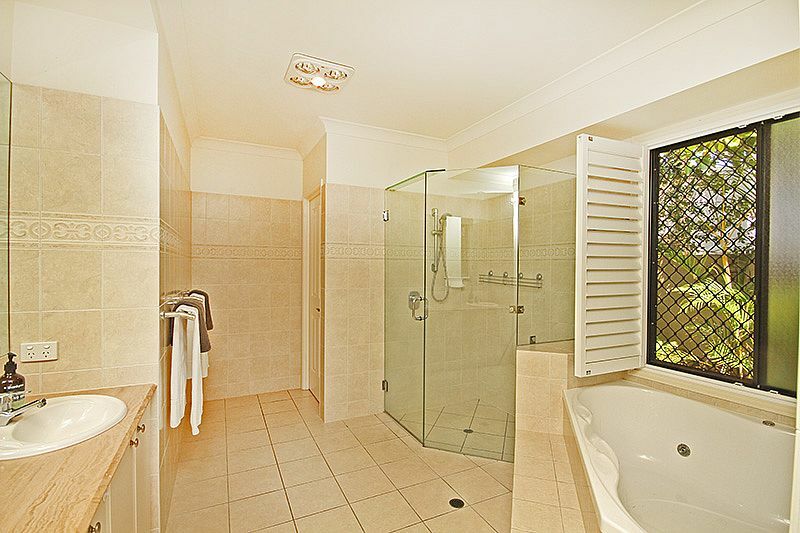 The Twin Waters village shops are mere minutes walk away offering the village grocery store, a Medical Practice & Chemist, renowned Sunshine Coast restaurant plus a fabulous cafe and the beautiful Mudjimba beach is only a 5minute drive away. Elegant yet relaxed interior design throughout, offering a huge gourmet stone kitchen benches and gas cooking with waterfront views across the canal. The home sleeps 8 people so is ideal for two families/couples with ducted air conditioning & ceiling fans for year round comfort. 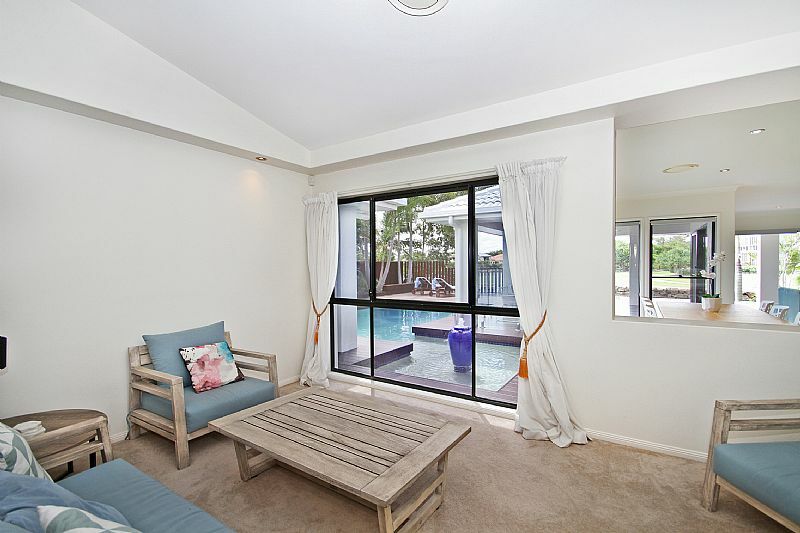 There are four generous double bedrooms, including an expansive plush master with its own private courtyard offering direct access to the pool & private views over the waterfront canal where you can totally relax under the swaying palm trees. 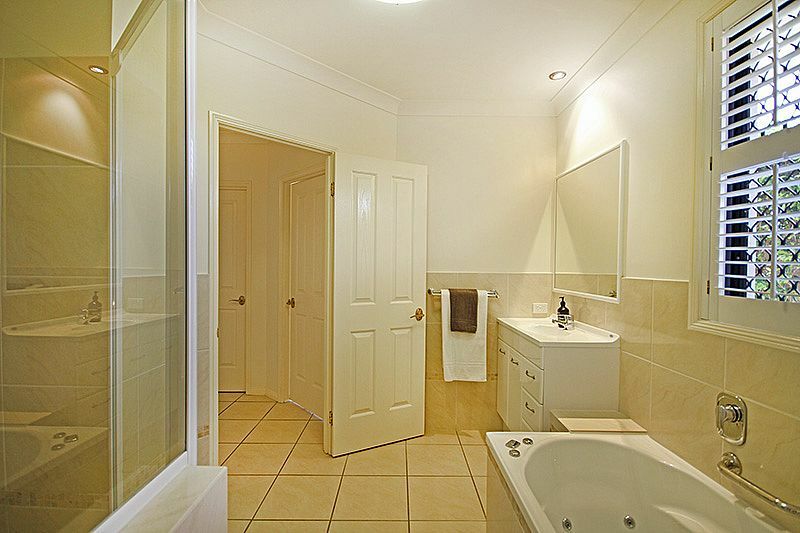 There is another bedroom with its own ensuite & the third bedroom offers ensuited family bathroom access that is shared with the fourth twin king single room. lus an inviting fully screened huge outdoor entertaining area with direct access to the pool & waterfront canal. 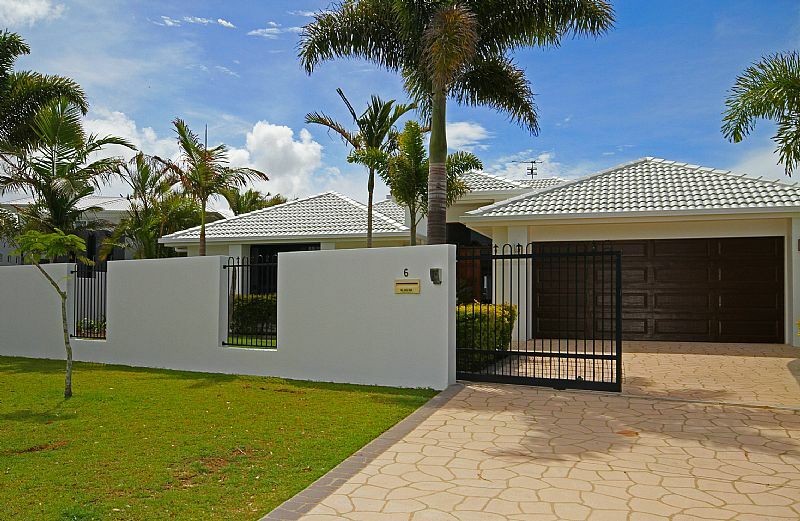 Well established stunning tropical gardens provide privacy and are fully fenced (including the waterway) so the home is great for families with young children. The house is situated on the canal and has secure parking area for one car in the garage and loads of off street parking and security gate. 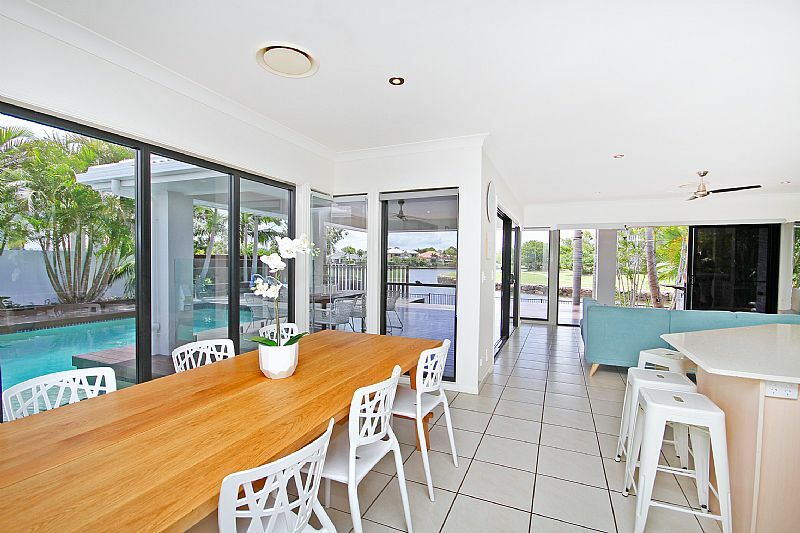 The home is a fabulous place to have a relaxing Sunshine Coast holiday with direct access from the front deck/jetty onto the canal out to the Maroochydore River, so bring your SUPS or kayaks! Walk to Twin Water Golf club for 18 holes (or lunch!) 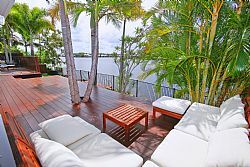 or given the abundance of aquatic life, just throw the fishing rod off the front deck jetty and relax. The Twin Waters village shops are mere minutes walk away offering the village grocery store, a Medical Practice & Chemist, renowned Sunshine Coast restaurant plus a fabulous cafe and the beautiful Mudjimba beach is only a 5minute drive away. 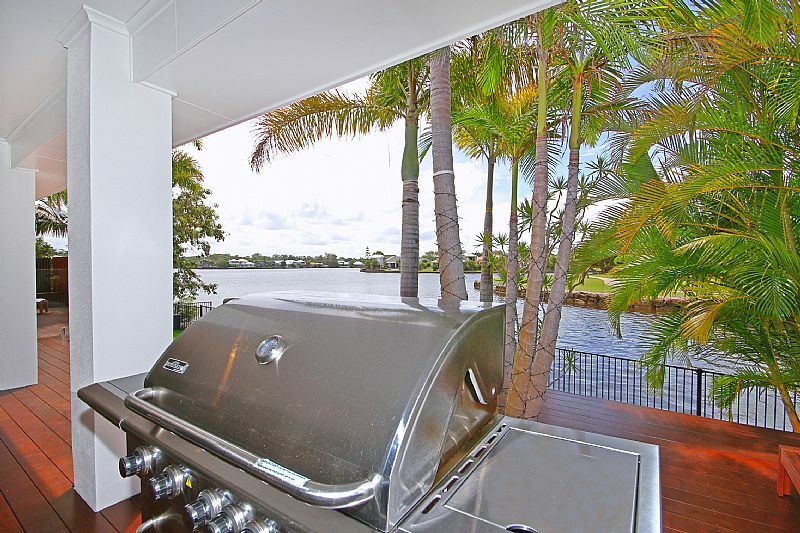 Elegant yet relaxed interior design throughout, offering a huge gourmet stone kitchen benches and gas cooking with waterfront views across the canal. The home sleeps 8 people so is ideal for two families/couples with ducted air conditioning & ceiling fans for year round comfort. 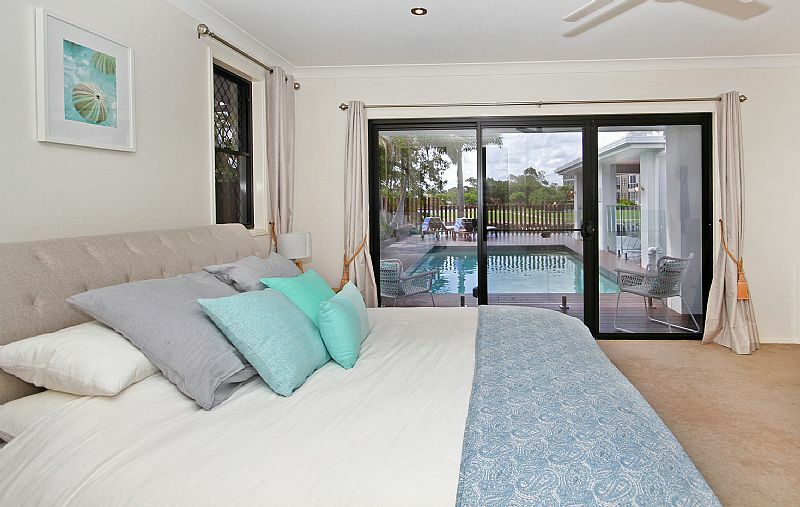 There are four generous double bedrooms, including an expansive plush master with its own private courtyard offering direct access to the pool & private views over the waterfront canal where you can totally relax under the swaying palm trees. 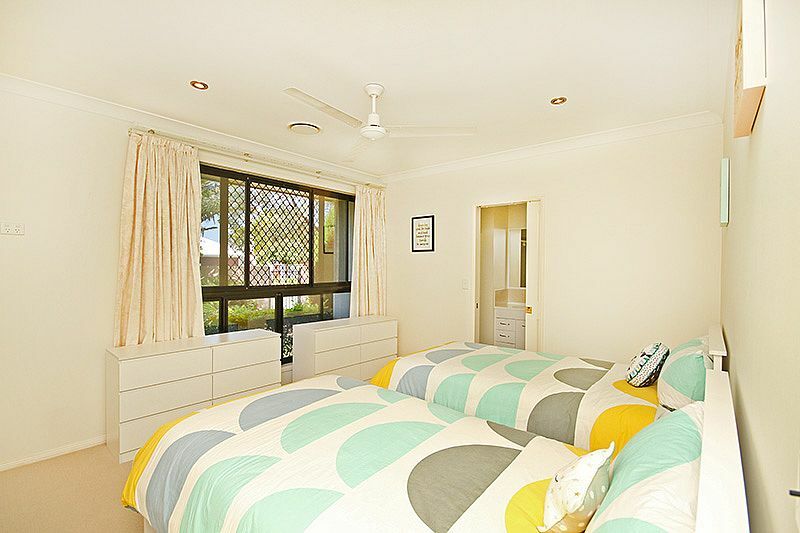 There is another bedroom with its own ensuite & the third bedroom offers ensuited family bathroom access that is shared with the fourth twin king single room. 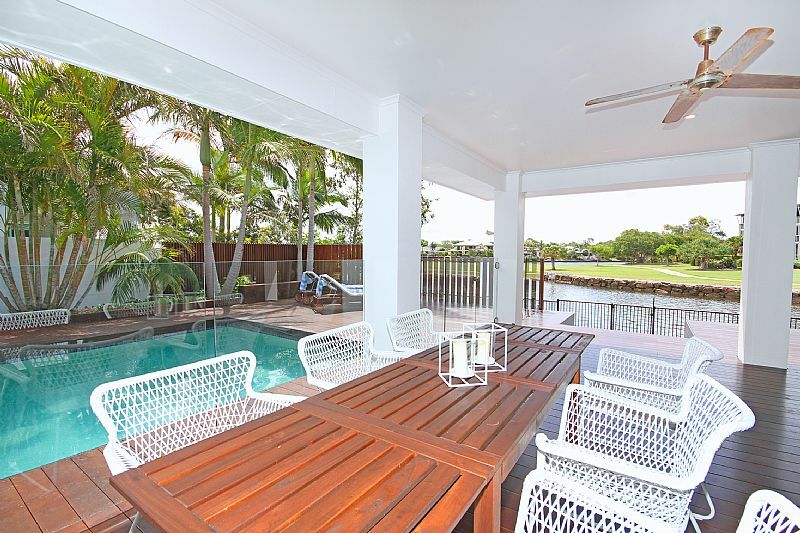 The formal lounge/media room boasts high ceilings, there is a separate dining area within the open plan kitchen/living space, plus an inviting fully screened huge outdoor entertaining area with direct access to the pool & waterfront canal. 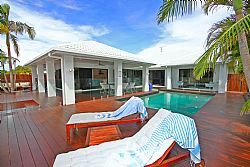 Well established stunning tropical gardens provide privacy and are fully fenced (including the waterway) so the home is great for families with young children. Laundry: Fisher and Paykel Top loader Washing Machine & Dryer.